This was sort of inevitable. Their strengths do compliment each other and the combination and miniaturization may provide a viable product. Both technologies on their own have struggled to move forward. It is still all about size and this is a clear strategy to get there. Sooner that later it will happen. We are already most of the way home with a wide range of protocols. 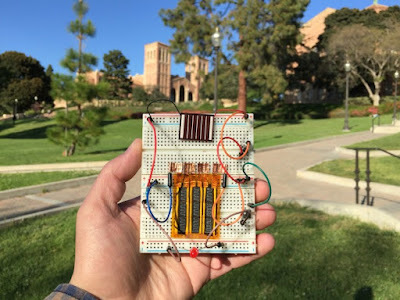 In the meantime we wait and make do..
Scientists at UCLA's California NanoSystems Institute have developed a new device that combines the high energy densities of batteries and the quick charge and discharge rates of supercapacitors. The hybrid supercapacitor is reportedly six times as energy-dense as a commercially available supercapacitor and packs nearly as much energy per unit volume as a lead-acid battery. Batteries can store a lot of energy in a small and light package, but they can’t charge or discharge very quickly or last a long time the way supercapacitors can. A single device that combines all of these positive attributes could change the entire technological landscape of today, leading to lighter, compact phones and electric cars that charge in seconds instead of hours. Professor Richard Kaner and Dr. Maher El-Kady have made an important step in this direction by creating a high-performance hybrid supercapacitor. Like other supercapacitors, their device charges and discharges very quickly and lasts more than 10,000 recharge cycles. But, according the scientists, their invention also stores six times more energy than a conventional supercapacitor, holding more than twice as much charge as a typical thin-film lithium battery in one fifth the thickness of a sheet of paper. The amount of energy that can be stored in such a device depends in large part on the contact area between the electrolyte and the two electrodes: the greater the contact area, the more energy can be stored. Previous hybrid supercapacitors used porous structures in the electrode to maximize this area, but the pores were simply too big, and therefore too few, bearing relatively little effect on performance. Kaner and El-Kady used manganese dioxide (a material used for alkaline batteries) for the electrodes, but also added a special three-dimensional laser-scribed graphene (LSG) structure. Crucially, this graphene structure was specifically designed for high conductivity, porosity and surface area, allowing the device to pack much more energy per unit volume and mass. "Even though our electrodes are thin (around 15 microns), they are capable of storing more charge than the 100–200 micronmeter thick commercial supercapacitor electrodes mainly because our hybrid LSG/MnO2 electrodes are very energy dense," El-Kady told Gizmag. According to the researchers, the supercapacitors can reach energy densities of up to 42 Wh/l, compared with 7 Wh/l for state of the art commercial carbon-based supercapacitors. Their device also provides power densities up to around 10 kW/l, which is 100 times more than lead acid batteries and on the higher end of performance for commercial supercapacitors. "The LSG–manganese-dioxide capacitors can store as much electrical charge as a lead acid battery, yet can be recharged in seconds, and they store about six times the capacity of state-of-the-art commercially available supercapacitors," says Kaner. Supercapacitors are usually stacked on top of each other and packaged into a single unit, but the researchers have been able to take advantage of the thinness of their device by integrating it inside a solar cell array. In this application, it was found that the supercapacitor could quickly store electrical charge generated by a solar cell during the day, hold the charge until evening, and then power an LED overnight. This is just one of many potential uses for the technology. "Let’s say you wanted to put a small amount of electrical current into an adhesive bandage for drug release or healing assistance technology," Kaner said. "The microsupercapacitor is so thin you could put it inside the bandage to supply the current. You could also recharge it quickly and use it for a very long time." Kaner tells us his team is now exploring using these electrodes to build hybrid supercapacitors on a large scale. You can see the device at work in the short video below. The research is described in the journal Proceedings of the National Academy of Sciences.